Khushi Feet held its second Murder Mystery night on Saturday 4 November and it was a great success! The event took place at Mount Ephraim’s manor house, an impressive venue in Hernhill near Faversham in Kent. 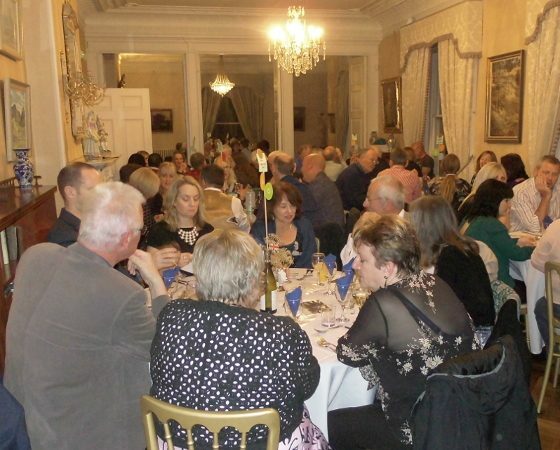 The Bonfire-themed murder mystery entertainment unfolded around a three-course meal which was provided by local Indian chef Corinne Goodman with dessert provided by The Great British Bake Off semi-finalist, chef and author Chetna Makan. While coffee was served, guests filled out their accusation forms before the actors’ denouement revealed the murderer. Prizes and booby prizes were then awarded to the winning and losing tables. Best of all, the evening made a whopping £1567! This impressive total is thanks to the generosity of our guests, the hard work of our volunteers and the support of those who provided their services for the night. Special thanks to: the owners of Mount Ephraim for allowing us to use their beautiful venue, Nigel Fairs and 368 Theatre Company for providing such brilliant a murder mystery for us to solve, Corinne’s Creative Kitchen for cooking really delicious starters and main courses for our guests, and Chetna Makan for preparing a divine dessert and generously donating the profits from the sales of her book ‘Chai, Chaat & Chutney’ to Khushi Feet. This money will be sent to the GNCEM street schools in Kolkata and spent on new clothes which will be given to the children as Christmas gifts. These children live on the streets or in slum areas of the city and own nothing – nice new clothes to wear will help the children to know that they are incredibly special and valued. To be the first to hear about similar fundraising events in the future, sign up to our mailing list.